The château of Châteaudun, located in the south of the Eure et Loir department, is often considered the “first château of the Loire region” for visitors coming from Paris. Spectacular in size, this château features a rare combination of mediaeval, Gothic and Renaissance architectural elements and is known for its unrivalled authenticity. The property was built between the 12th and 16th centuries, and is a living museum of history and architecture. Châteaudun, a rocky spur overlooking the Vallée du Loir on the outskirts of Beauce and Orléans, is the ideal location for a fortified château. It was for this reason that Theobald V, Count of Blois and a descendant of the famous Theobald I (known as “the Trickster”) built a “vast tower” here in the late 12th century. This keep, standing at 31 metres high and the only remaining vestige of the mediaeval château, is undoubtedly one of the most imposing and best preserved examples of its type in France. Almost two centuries later, the château of Châteaudun passed into the ownership of Jean d'Orléans, a close friend of Joan of Arc. The “Dunois” wing was built between 1450 and 1468. This dwelling consists of two floors below a vast attic space, and its layout and design reflect the desire for comfort that followed the end of the Hundred Years' War. One particularly good example is the vast kitchens, with vaulted beams that lead to monumental fireplaces, revealing the important role that food played in the life of a 15th century prince. The bath apartment and hanging garden reflect the “hedonistic” lifestyle of the period, combining bathing and sensory pleasures. He also built a Gothic chapel adjoining the keep. The chapel was designed to hold the relics of the Passion of the Christ. It is a highly ornate structure featuring 15 coloured statues of male and female saints, along with a mural of the Last Judgement. The descendants of Dunois, and in particular his son and his grandson, the first Duke of Longueville, completed the work in the 16th century by building a second wing extending towards the Loir (the so-called “Longueville” wing). Early signs of the Renaissance can be seen here. This wing features large formal rooms and the apartments of the Orléans-Longueville family, decorated with a collection of tapestries from the workshops of Amiens, Paris and Brussels. The château of Châteaudun is notable for the gradual shift from the Middle Ages to the Renaissance, with both styles co-existing in harmony. 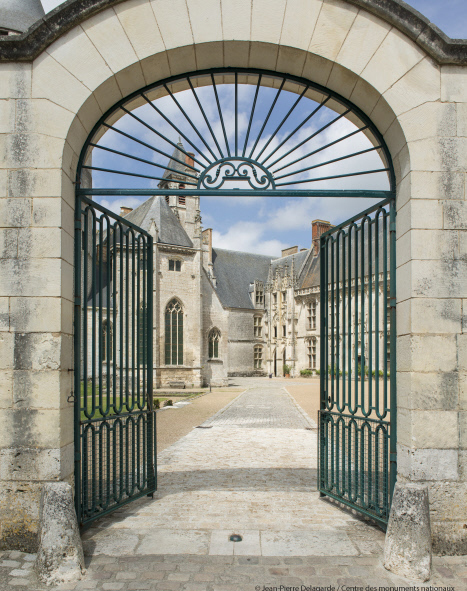 The courtyard, located between the “Dunois” and “Longueville” wings, retains two original mezzanine staircases, one in flamboyant styling and the other, with the same layout, from the Renaissance period. The château was abandoned for many years, and was saved from ruin when it was acquired by the State and restored by Jean Trouvelot just before the Second World War. The château of Châteaudun remains one of the most prestigious examples of eight centuries of history to this day.